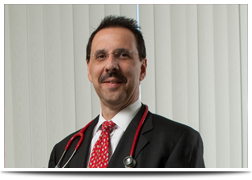 Dr. Robert J. Tozzi, M.D., F.A.A.P., F.A.A.C, is Chief of Pediatric Cardiology and the Founding Medical Director of The Gregory M. Hirsch Hypertrophic Cardiomyopathy Center at the Hackensack University Medical Center (HUMC), Hackensack, N.J. He is the past-Director of the Sports Readiness Program at The Pediatric Center for Heart Disease and past-Co-Director of the Pediatric Intensive Care Unit at HUMC. Tozzi also served as a Clinical Instructor of Pediatric Cardiology at the New York University Medical Center. In addition to holding a medical license from the State of New Jersey, Tozzi holds certifications from the American Board of Pediatrics and the American Board of Pediatric Cardiology. He is responsible for obtaining more than $1.75 million in grants for the perfection of biomedical technology applications, as well as the development of hospital infrastructure and facilities. He is a current Fellow of the American Academy of Pediatrics; a Fellow of the American College of Cardiology; a current member of the American Medical Association; the Bergen County Medical Society; the Academy of the Pediatrics, Section Member of Cardiology, Neonatology, and Sports; the Society of Critical Care Medicine; the Northeast Pediatric Cardiology Society; and the Pediatric Oncology Group. Tozzi is the Medical Director of the Ukrainian Gift of Life, Glen Rock, N.J., and was the Founder, Medical Director, and Member of the Board of Trustees of Hope with Heart, the first summer camp for children with heart disease in the State of New Jersey. He is the co-author of several papers published in refereed research journals, and he has lectured extensively in his field at numerous professional conferences. Tozzi graduated Board Certified in Pediatric Cardiology from New York University Medical Center. He performed his Pediatric Residency and was Board Certified in Pediatrics at the University of Medicine and Dentistry of New Jersey (UMDNJ), where he also received an Award for Excellence in Continuity of Health Care. Tozzi obtained his M.D. from UMDNJ (Alpha Omega Alpha Medical Honor Society), and graduated as Valedictorian with a Bachelor of Science degree in Biochemistry (Phi Beta Kappa-NJ) from Upsala College, East Orange, N.J. This entry was posted in Bio by admin. Bookmark the permalink.